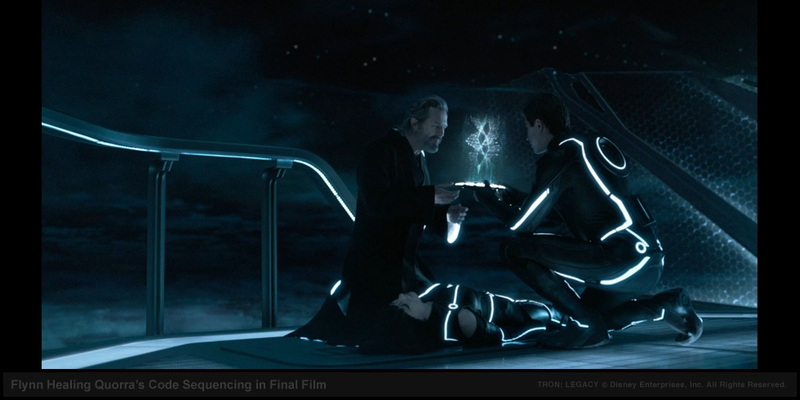 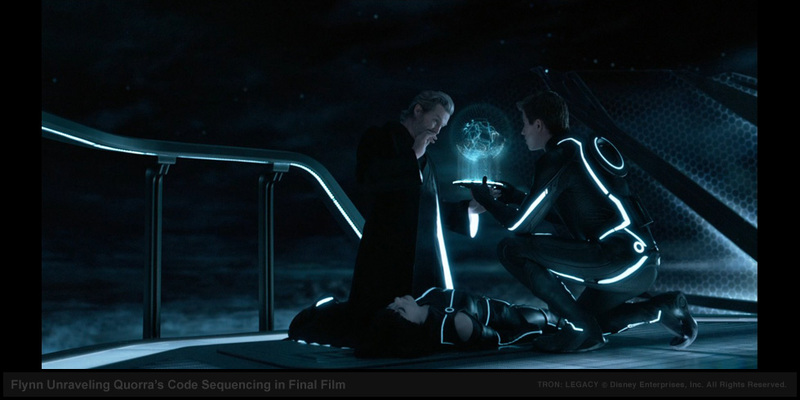 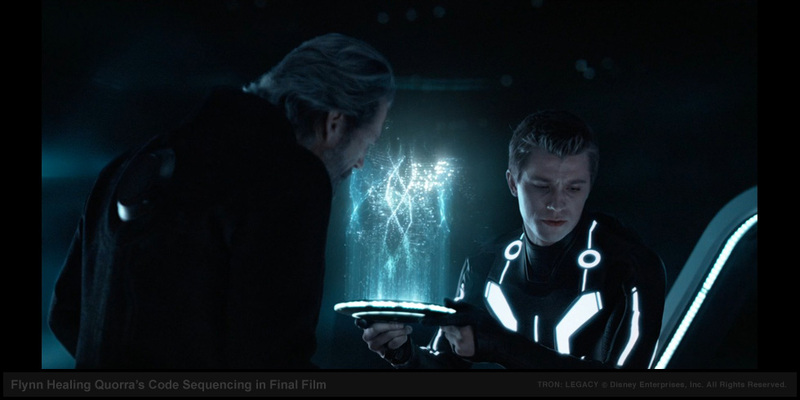 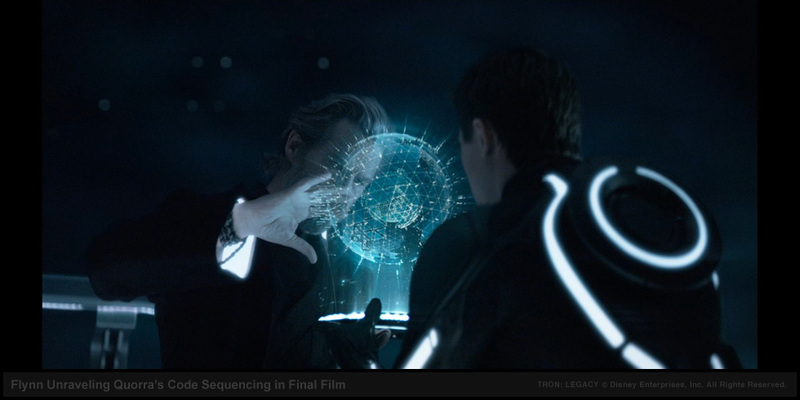 As Flynn and Sam take a ride on the Solar Sailer with Quorra, we pause from the action to witness what our small but agile TRON GFX team was tasked to create from scratch - a series of beautiful organic layered surfaces that ultimately reveal Quorra's isometric code structure down to her core DNA. 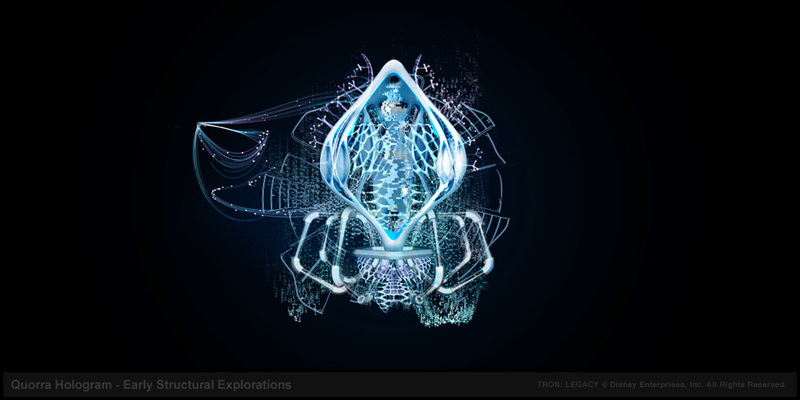 With our work cut out for us, Gmunk and I dived into research mode and found visuals that inspired us with new ideas based on existing natural phenomenon such as voronoi cell patterns, isometric surfaces, and the amazing nature drawings of Ernst Haeckel to just name a few. 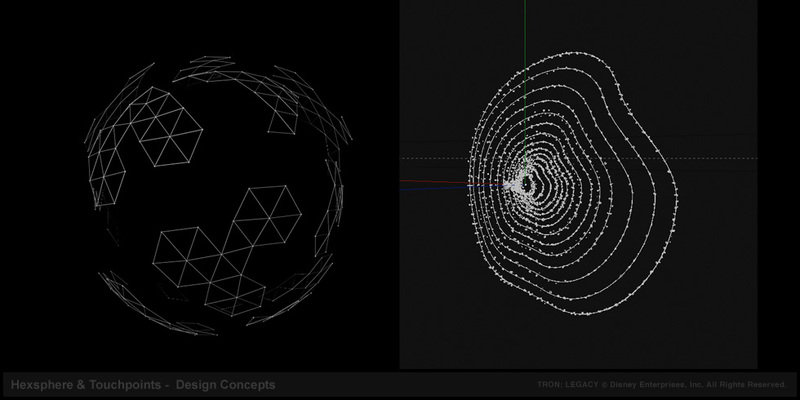 As numerous other graphics sequences needed our attention, it proved challenging to make headway on the Solar Sailer sequence which we knew needed as much of our attention as possible. 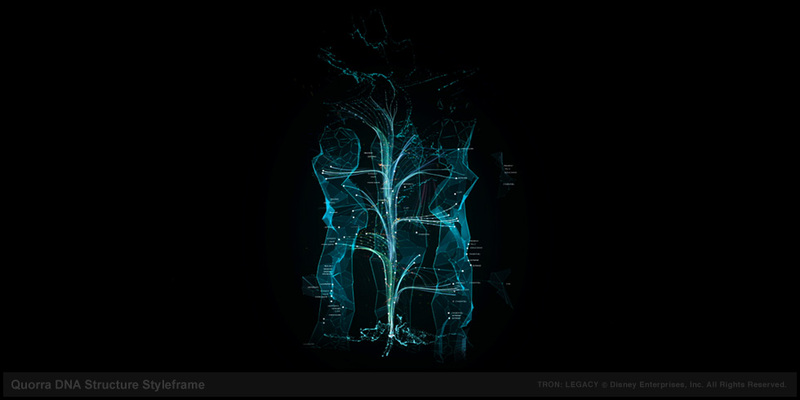 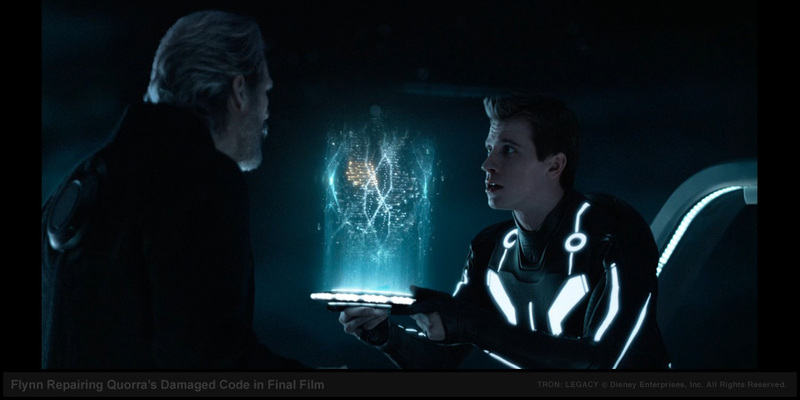 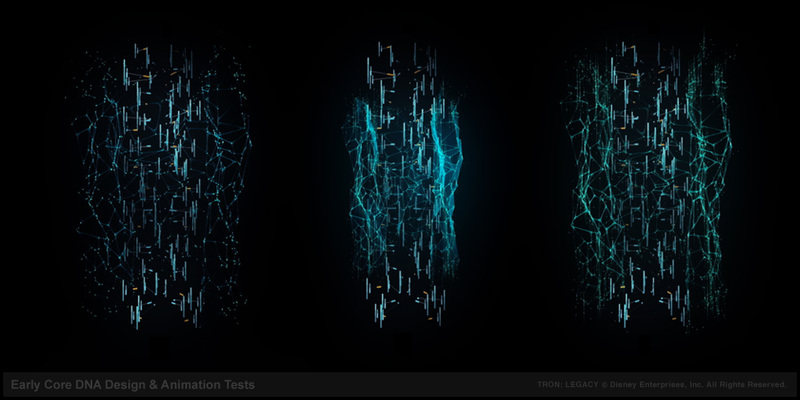 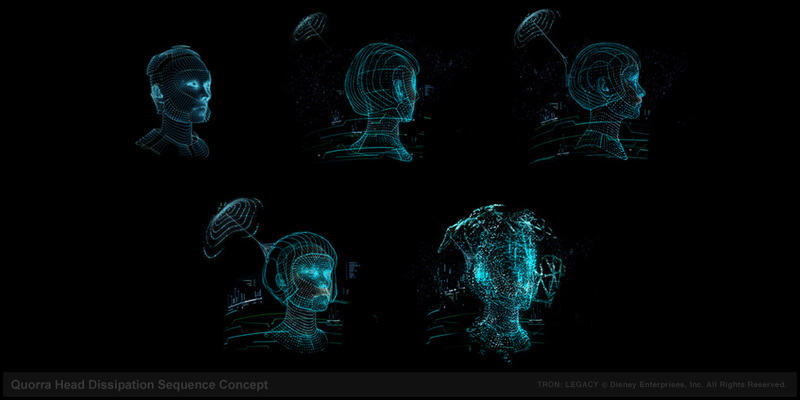 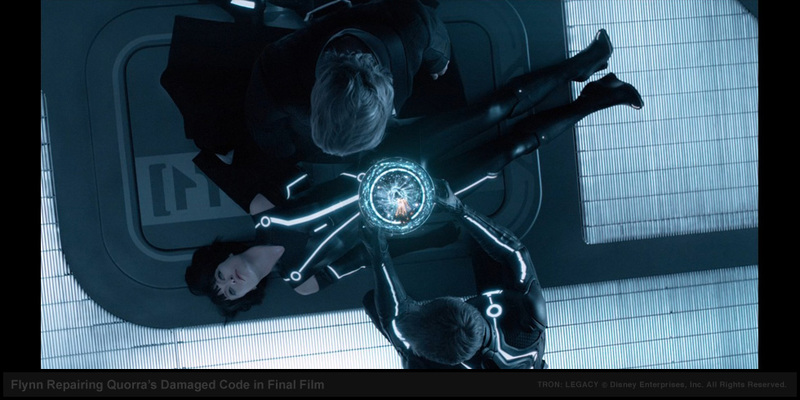 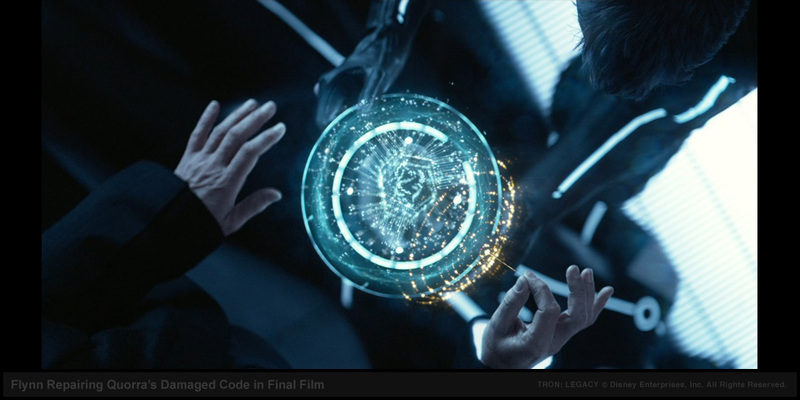 After numerous presentations and discussions with director Joseph Kosinski, we solidified a conceptual graphic underpinning behind the various layers of Quorra's organic code composition as Flynn eventually targets her damaged code and extracts it allowing her arm to regenerate itself. 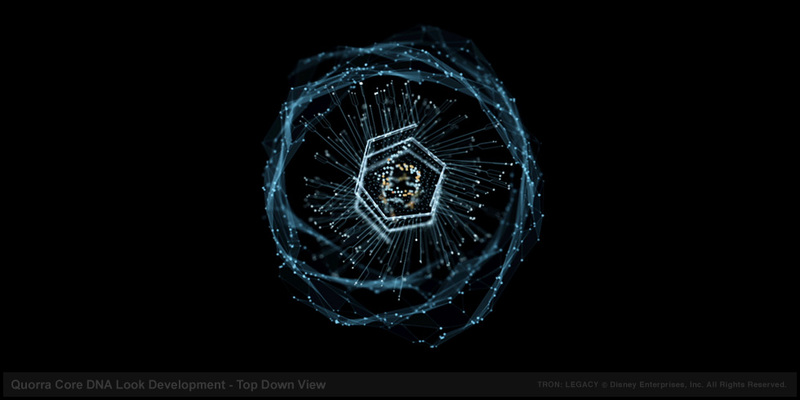 As a longtime user of Cinema 4D as a 3D program, I knew it would be invaluable tool for this sequence to prototype concepts, designs and animations that sparked further ideas in the animation and technical savvy hands of David Lewandowski (aka dlew) who led the animation charge on the entire hexsphere set of shots using C4D's mograph tools, xpresso, Vray, and 3d stereo output. 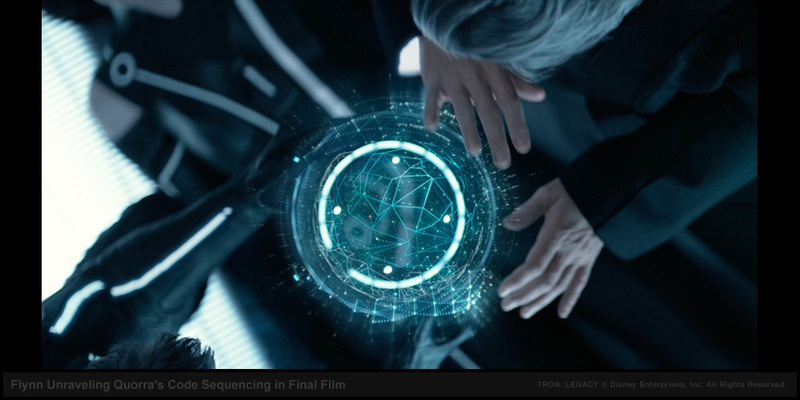 The entire Solar Sailer sequence was too daunting in the timeframe for just one key animator due to the additional set of DNA shots, so we recruited an impressive amount of C4D and Houdini talent in the form of Adam Swaab who absolutely nailed the DNA shots and provided a great range of passes for DD's compositors in Nuke. 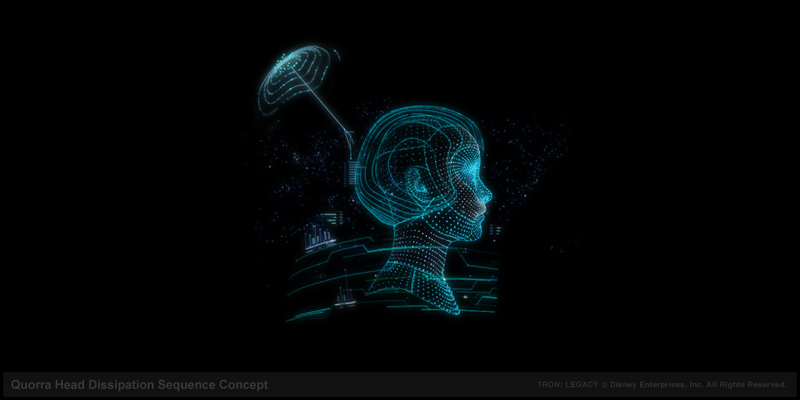 Another key section of the Solar Sailer gfx sequence came from an app that Gmunk and I art directed and was custom coded in Open Frameworks by code artist Josh Nimoy. 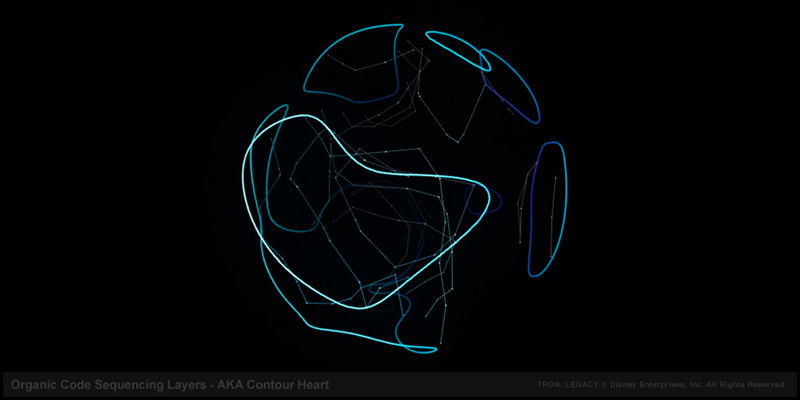 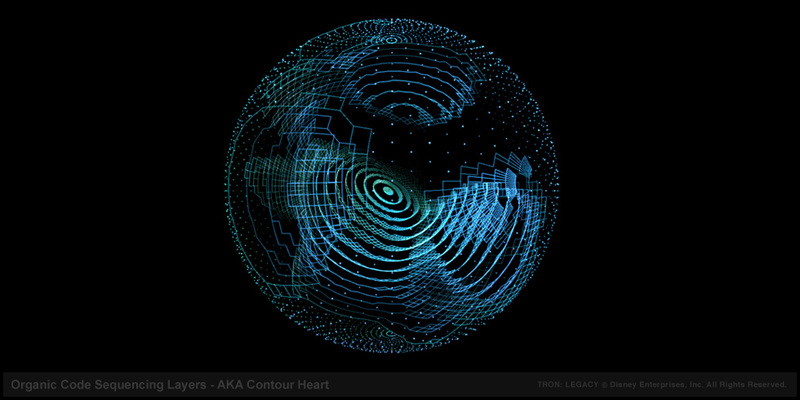 The app known simply as Contour Heart gave us a fantastic range of organic forms and customizable slider control to generate a truly unique looking surface under the hexsphere layers. 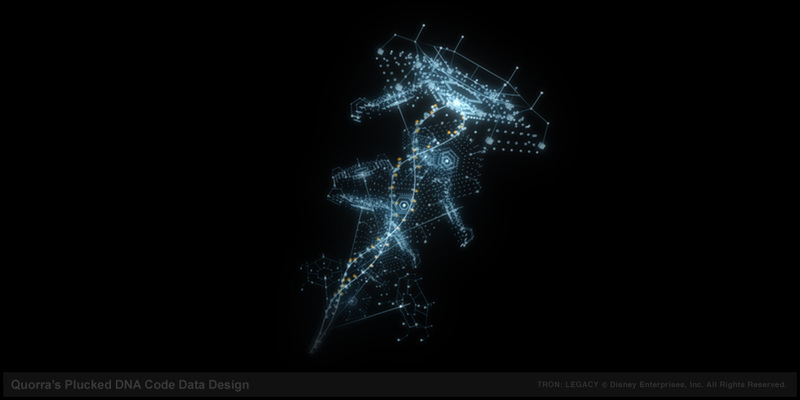 Joseph Chan helped round out the Solar Sailer graphics team bringing Quorra's disc data glow to life with delicate animated graphics. 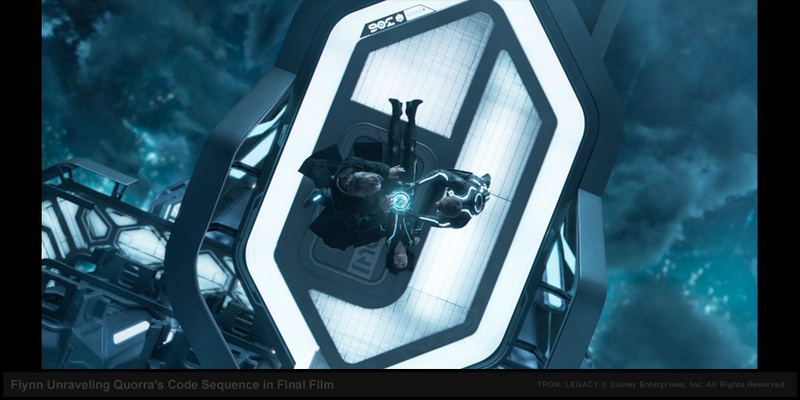 It took the combined best talents of the core gfx team to deliver what ended up as the final graphics sequence in the film. 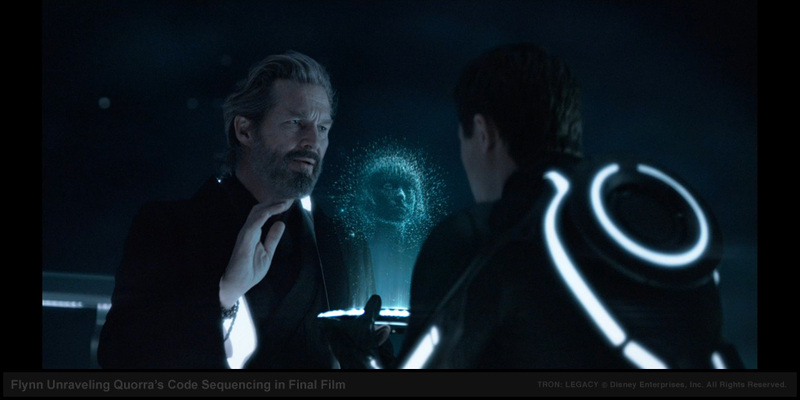 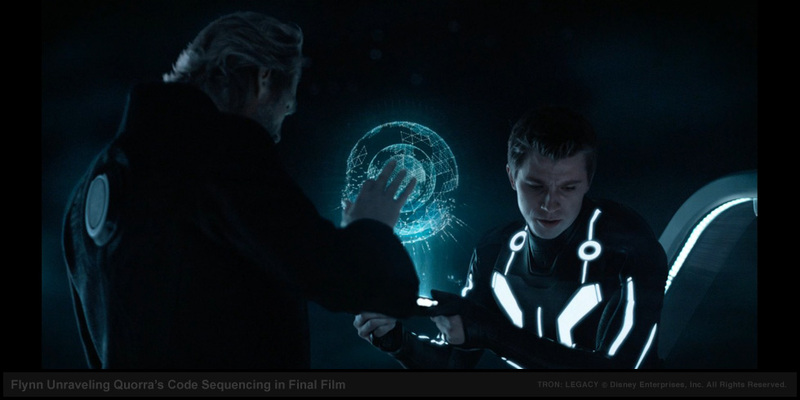 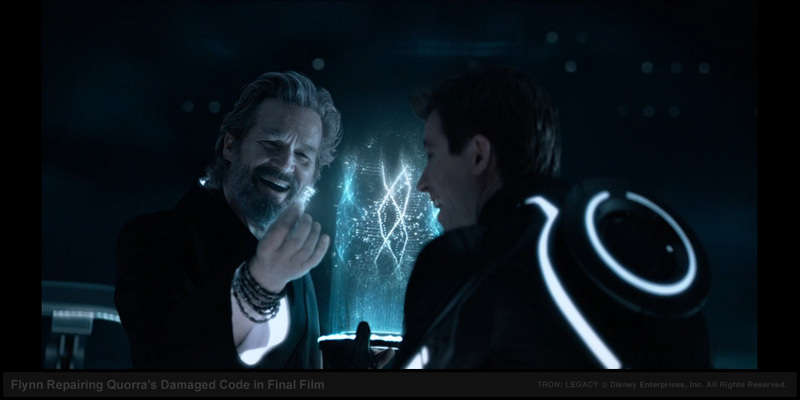 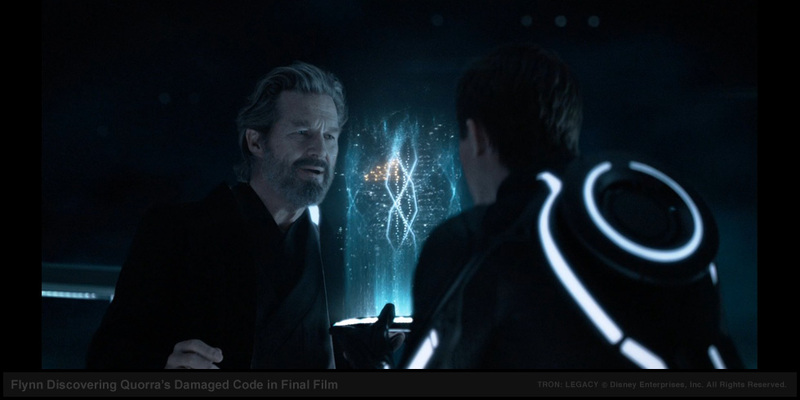 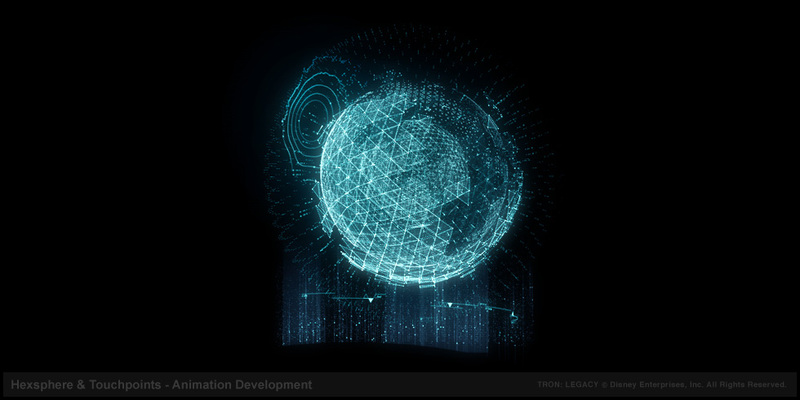 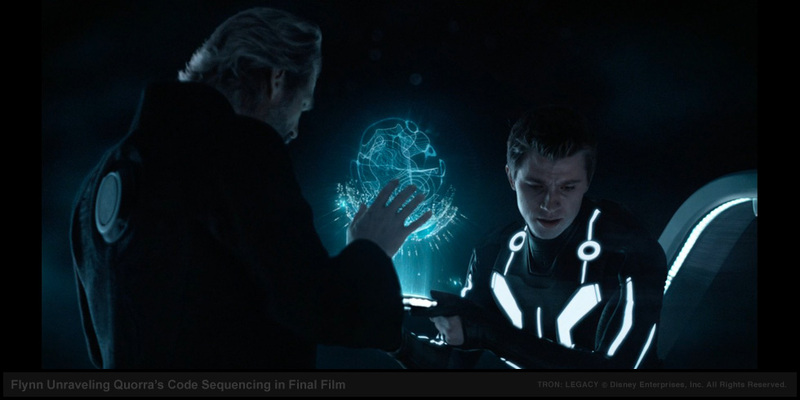 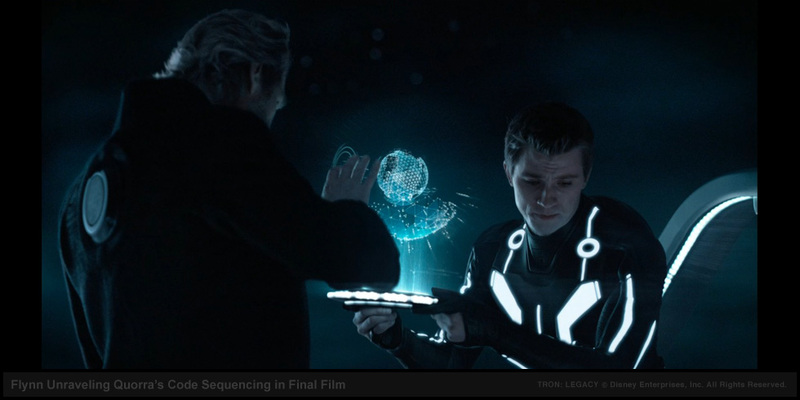 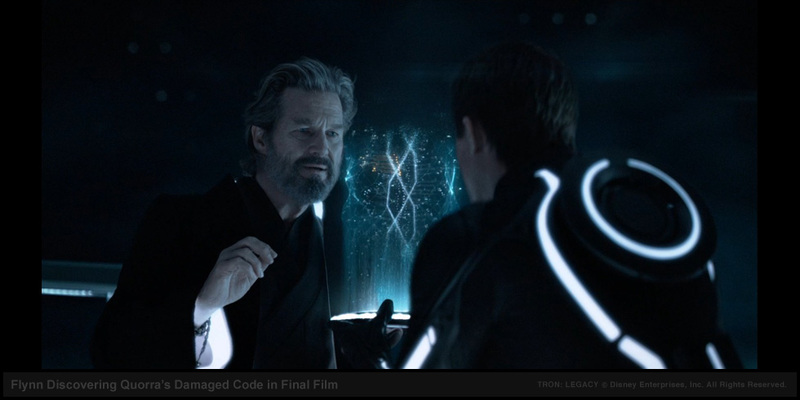 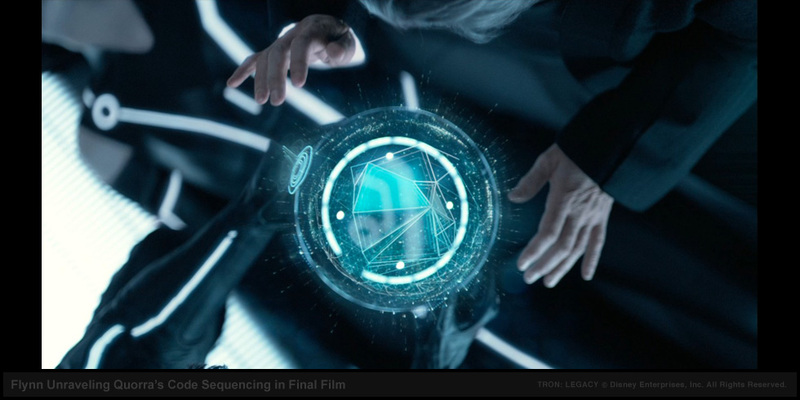 We hope it will stand the test of time and serve as an important reference point in the ever increasing amount of holographic screen interfaces created for films both past, present and future.